You can literally whip this meal up in 10mins. It’s fantastic on those nights when you dont have anytime but need to up your green intake. Throw all the pesto ingredients into your blender/food processor. Spiralize your zucchini and throw it all together BOOM. Done. Bonus: You can take it for lunch the next day, it doesn’t need re-heating and will keep its nutritional value!! The Pesto itself, is fantastic to spread on Sweet Potato toast, Bread, or even cheese and biscuits if your entertaining. Make a little bit extra, and store it in a glass jar for another meal. It is boosted with superfoods like, Spinach, Basil, Pinenuts, Macadamias and Avocado. If you need to make a nut-free version, it will still be super delish. Note: Pine nuts belong to the seed family, not nut family! 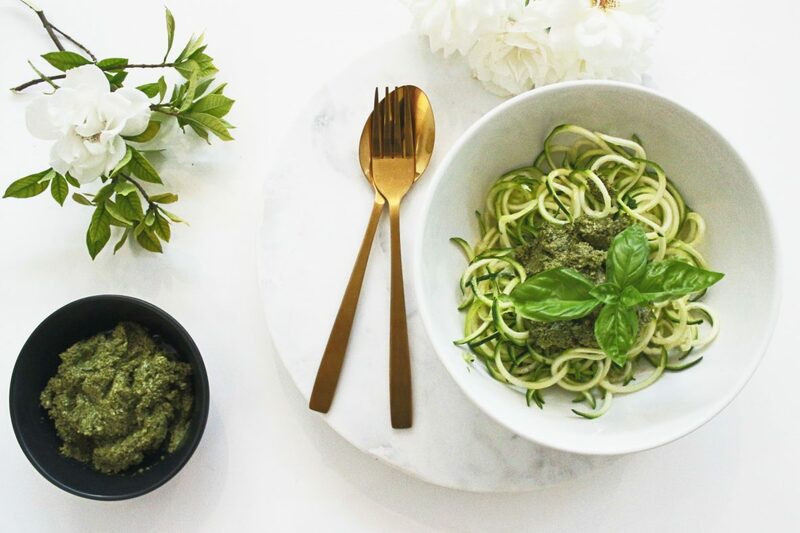 Pesto Pasta is a massive comfort food for me, so why not make it more nutrient dense by using zoodles instead. I’m late to the party, but I am now slightly obsessed with zoodles!! Use a spirilizer or you can use a peeler to slice the zucchini into noodle form. Wash and strip leaves the leaves from the basil and place in a food processor. Add the lemon juice, salt, peccorino and nuts. Blend for 2 minutes, then add the garlic infused oil, if it needs more liquid use water. Continue to blend for 2 – 3 minutes until mixture is soft and creamy. Add to zoodles or pasta! Bon Appetite! Note: you can lightly pan fry the zoodles and pesto for 1 minute if you prefer a warm meal.